Sausage (or Steak) & Egg Popovers! | sandwich surprise! 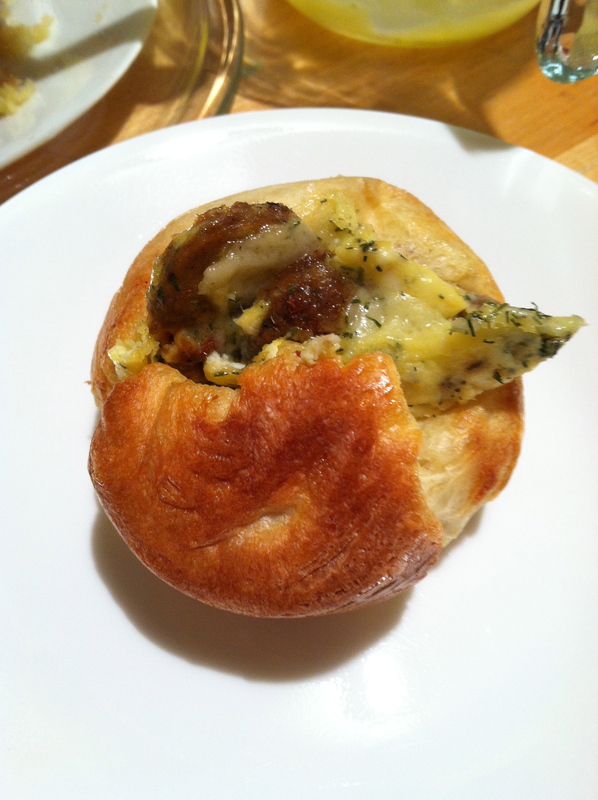 Home » Food » Sausage (or Steak) & Egg Popovers! I’m a sucker for popovers. They’re super simple to make, and they’ll happily go whatever way you want them to — sweet (strawberry jam! maple butter! ), savory (scrambled eggs!) or both (fig spread and cheddar!). Yum. 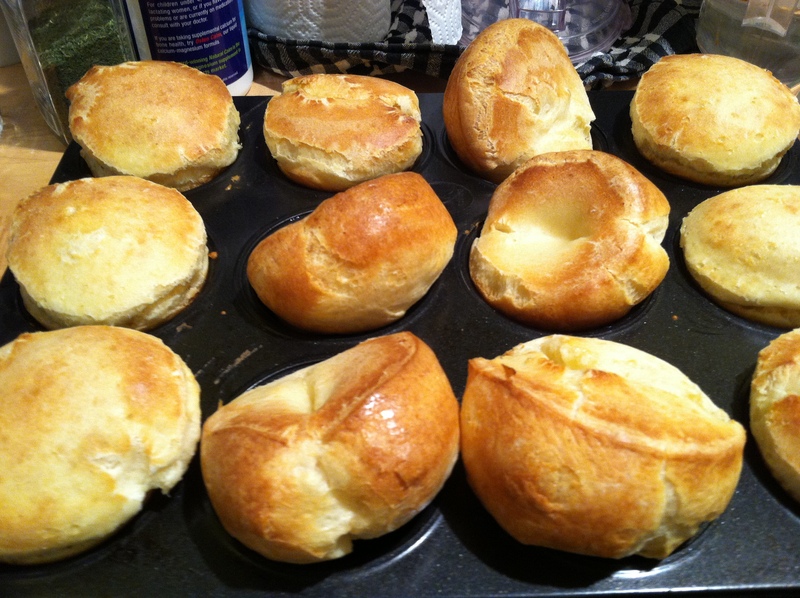 For the popovers, I always use Mollie Katzen’s quick recipe from Moosewood Cookbook. 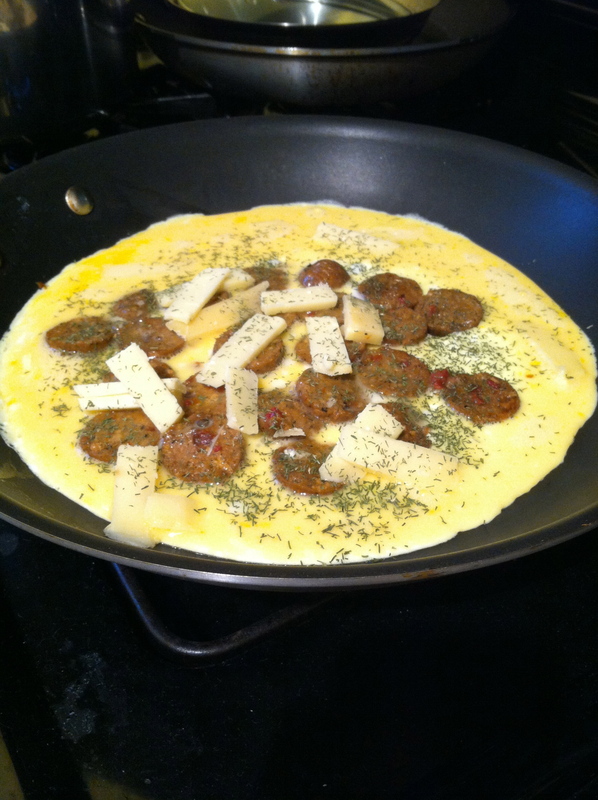 For the omelette, I used the remaining butter in a skillet, and sautéed slices of Tofurkey Italian sausage (because I had them ready in the fridge; feel free to use the real kind) until they were lightly fried, and then I poured four beaten eggs on top, layered slices of gruyere and sprinkled dill over that. For today’s surprise, it turned out, we had steak in the fridge this morning, so I sprung the beef version of these on my neighbor, Santiago (far right), and his friends Gustavo and Hennessy — no doubt, the best trio of Sandwich Surprisee names ever. Hmm, maybe someday. In the meantime, it was fun being the popover fairy, leaving one for Santi’s daughter Jennifer and handing one to another neighbor, Maria, in the elevator. Preheat oven to 375˚. Melt the butter, and brush the cups of a 12-muffin pan. Beat the eggs and milk until incorporated, then whisk with the flour and salt until there is no dry flour in the mixture. There will be lumps, but they’ll bake out. Fill the muffin cups to 2/3. Bake in middle rack for 30 minutes. Serve immediately. I love a surprise in a sandwich!